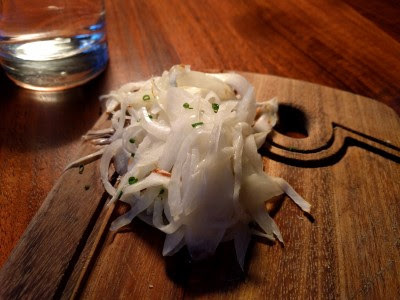 Bramling Cross was the third Ethan Stowell restaurant we went to in Seattle. It was a drizzly Saturday and we had spent the day at the Museum of Flight so we needed to relax and let all that information we read at the museum soak into our brains. Parking was, like nearly everywhere we went in Seattle, tough, but fortunately we found a parking lot about 1-2 blocks away that we could use. We were a little wet when we arrived so it was nice to settle into a comfy booth (although I sat on the "side" of the table which isn't really ideal but I just didn't feel like trying to transfer into the booth). I really liked the inside. It was cozy, inviting, pub like. 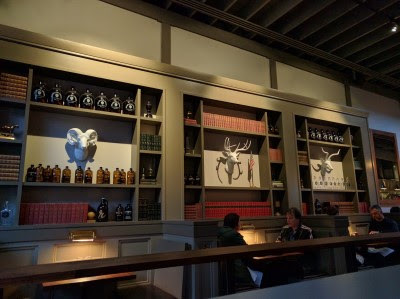 I liked all the shelves, the paint color, the little reading lights on each table (good for photos!). And there was an Oktoberfest special menu when we were there. SP had a beer (Stoup Marzen, an Oktoberfest special) and I had a glass of sauvignon blanc. 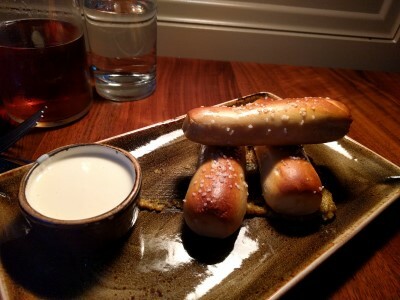 We started by sharing Housemade Everything Pretzels (Gruyere sauce, beer mustard). These were amazing. That dipping sauce? So good even SP wanted to lick the bowl. 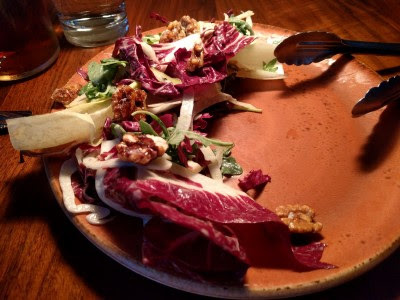 We also shared Treviso and Endive Salad (shaved pear, candied walnuts, fennel). The presentation was pretty but since it was salad, we mashed it all up in the middle of the plate, ruining the pretty, artistic crescent. I liked this salad, especially since it was different from the salads we usually eat. Even so, the flatbread was delicious. 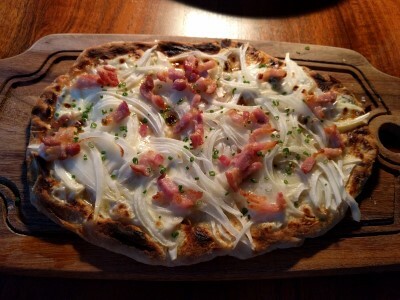 While I didn't eat the onions, the onion flavor was nice, the flatbread crispy, just enough bacon for a salty, meaty bite, and not overly cheesy. I really liked it. 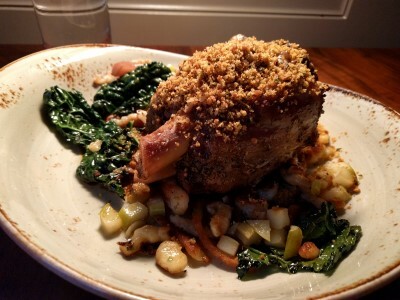 SP chose Pork Osso Bucco (Dijon spätzle, smoked red onion, roasted apple). It was really good. 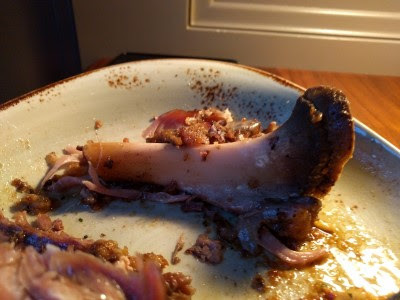 The pork fell off the bone, juicy & flavorful. It was a big portion, so he couldn't eat it all. He said the rest of the dish was excellent, too (I just tried the pork). Another solid place from Ethan Stowell. We were really happy with our meals at his restaurants. 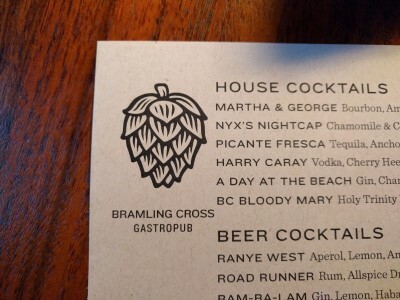 We'd go back to Bramling Cross. Good food and good, friendly service.